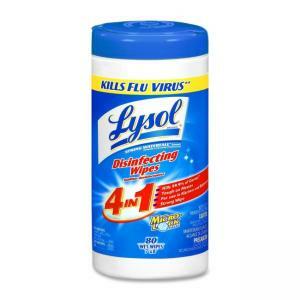 Lysol disinfecting wipes with Micro-Lock fibers are designed for cleaning hard nonporous surfaces. Hospital-strength disinfectant (the highest level available) kills 99.9 percent of germs in 30 seconds. Bleach-free, alcohol-free formula is virucidal, tuberculocidal, pseudominicidal and bactericidal. Wipes are designed for use in hospitals, healthcare settings, critical care areas, schools, nurseries, health clubs, clinics, animal holding areas, airports and more. Airtight canister package keeps wipes moist and effective. Pop-up tub easily dispenses one Lysol wipe at a time. Wipes are EPA-registered.